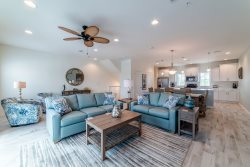 Enjoy your stay in Perdido Key's first master-planned resort community at Lost Key Golf and Beach Club which is nestled between Lost Key Golf Course and the Gulf of Mexico. The 413-acre gated community at Lost Key is surrounded by more than 300 acres of natural preserves and includes an 18-hole Audubon Signature Golf Course and complimentary beach shuttle. Bring your bikes and jogging shoes to appreciate 5 miles of biking and jogging trails which meander through the Resort. From the moment you enter Lost Key's gated community, you'll feel the serenity and beauty of nature. Every effort has been made to maintain the existing topography and natural landscape. The unique elevation of each brand new, luxurious townhome conforms to the environment. Buildings have been arranged to maximize natural water views, golf course views and native wildlife. Your spacious villa features open living areas with center-island kitchen and great room perfect for entertaining. Natural light streams throughout. Transferable golf membership included. Everyone at Perdido were friendly, knowledgeable and informative during our vacation stay. The Perdido property was very accommodating clean and a superb fit for our family vacation. We had a great time and the unit was excellent! All the staff were very accommodating! We had a great stay at Lost Key. The villa was perfect and we look forward to returning. I spoke with the staff through email and through phone calls. We arrived after hours so we picked our packet up after hours. Charlotte came by the next day and checked on us. We had a great experience at Lost Key. We had a great time at Lost Key. The villa, the staff, the experience was all fantastic. Hope to return soon!